Pursued in collaboration with the International Dark-Sky Association, SKYGLOW explores the history and mythology of celestial observation and the Dark Sky Movement that’s fighting to reclaim the night skies. There’s no such thing as a snapshot of the night. During the day, the camera’s shutter opens and closes faster than the blink of the human eye. But in the dark, long exposures capture crumbles of light suspended in the night and create detailed images of starry skies. Artificial light at night, even from a distance, can ruin long exposures and impair night photography. So when renowned photographers Harun Mehmedinovic and Gavin Heffernan sought the darkest skies on earth for their photo project, SKYGLOW, it was clear that IDA would be a natural partner for their success. The International Dark-Sky Association’s Dark Sky Places Program certifies and protects the darkest skies in the world, but IDA’s work in protecting night skies reaches far beyond the Dark Sky Places Program. Our most valuable resource is the community of people who care deeply about night skies and work to defend them. It was through conversations with the IDA community that Harun and Gavin began to realize people’s profound connection to the night sky beyond its aesthetics. “We kept coming back to the idea that the night sky is a resource,” Gavin said. “It’s about more than protecting the visuals of the night sky.” That idea is prevalent in the final compilation of their work. SKYGLOW is a hardcover photo book and time-lapse video series that explores North America’s darkest night skies, and the threat of light pollution to our environment. Beca use of your generosity SKYGLOW is now available for purchase. 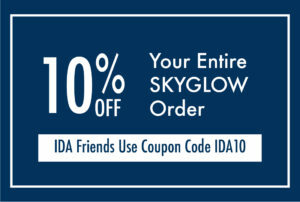 All contributions go toward the creation of more SKYGLOW materials to continue to spread awareness of light pollution.